For some, it's the smell of fresh-cut grass that makes them smile in the summer time. For me it's the smell of an outdoor grill. I do try to avoid charred meats...you know, the carcinogens - blah, blah, blah. But every few weekends, it's fun to fire up the grill and let the kids run around out back while I prep the meat. Those carcinogens taste pretty darn good, don't they? 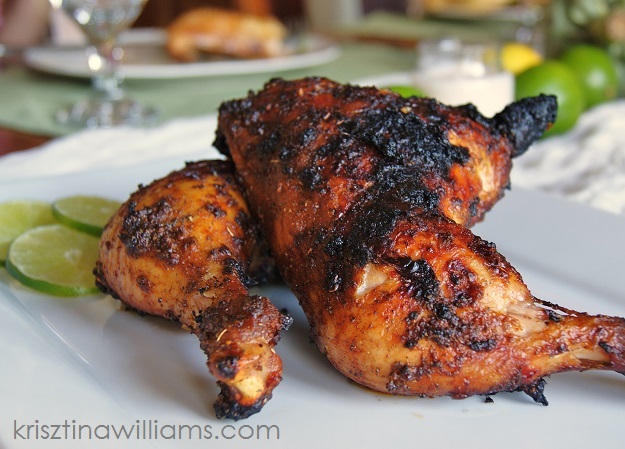 This Baha Citrus grilled chicken recipe is so easy and affordable, not to mention delicious. If you need to grill for a crowd, it's perfect. You can use different cuts of chicken with the skin on, but I love to use the thigh and leg quarters because they're easy, and they always seem to be on sale at my local grocery store. I paired it with grilled corn on the cob and a quick salad. It made for such an easy-breezy summer dinner party. Prep the marinade the night before. Mix the spice packets according to the directions on the bags, replacing the water with lime juice. Marinading the chicken in something acidic overnight will help break down the proteins and makes for a super juicy chicken. Before grilling, rub the spice mixture over the chicken one more time to coat the top with plenty of the spices and get as much of the liquid on the bottom. 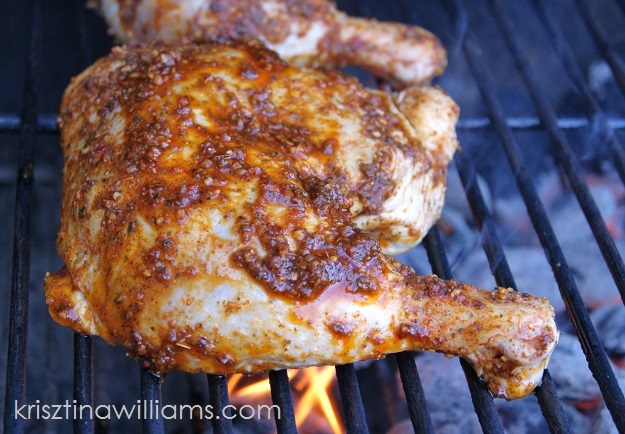 After you've lit the grill, and the charcoal has burned down as usual, place the chicken on skin-side up over indirect heat and grill for about 30 min then turn over and grill about 10-15 more minutes. Cut into the thickest part of one thigh to make sure the meat is thoroughly cooked. Let rest 5-10 minutes before serving. Oh, that looks--and sounds--really good! Looks delish and no doubt tastes it too! :-) Would it work with pork chops? Yeah, it would work with pork too!